The Hungarian Parliament accepted a bill referred to as “slave law” on December 12th in a scandalous session.. The governing party endorsed the proposition with no social dialogue beforehand. Setting new standards for maximum overtime and its payment the bill sparked outrage and militant protests unseen for over a decade. The parallel privatisation of a university and attacks on academic freedom put students next to workers in the line. The opposition also found its voice while the government blames on George Soros. Newly emerged possibilities place great stress on the trade union movement, opposition parties, and the “civil sphere” in Hungary. At the same time these possibilities open prospects for renewing leftist strategies. What is the slave law? The recent law makes it possible to do 400 hours of overtime every year with the written consent of the employee. It remakes the accounting system, to allow the calculation (and payment) of extra working hours in a three-year period. This is a huge step back from the earlier maximum of 300 hours (with a collective agreement) and will cause working life to be unbearable. To accept the signed consent as a guarantee ignores the unequal relationship between employee and employer to the latter’s advantage. The new policy makes it possible to give workers only two rest days in a month (if working in seasonal work, or other non-conventional terms) without extra compensation for overtime. Also, the breaks during shifts won’t be counted as working time. Trade unions rejected these changes with the strongest terms emphasising its exploitive nature and the absent of any coordination before the law-making process. With this bill, Hungary takes the lead in the potential maximum overtime and working time flexibility among OECD countries. Make flexibility greater than in any country in the European Union raises a question: why is it necessary? Why would a government supposedly committed to defend its people against foreign influence and speculators reduce human life to bare life? We can find the answer if we look at the economic dependencies of Hungary/the region and the resulting need for semi-skilled labour. The main page of the National News during protests before its building. Main headline: “The protests does not have any popular support among the society”. in part by Foreign Direct Investment (FDI) in the semi-periphery bought new dependencies and grievances both for workers and for fractions of the capitalist class. Part of the economy has become based around low-value added jobs by MNC’s particularly in the automobile industry. To secure the trust and profit of these companies, the whole economic environment must adapt to these challenges, a transformation bearing the prospect of great social turmoil. Hungary is pressured to out-do other Eastern-European countries in “competitiveness”: in the supply and flexibility of the workforce, taxes, and other conditions determined by state policy. This process results in a race to the bottom in terms of labour conditions, wages, and taxes, with every movement toward “competitiveness” resulting in worse living and working conditions. The taxes are the region’s lowest, just like the wages. The current government faces a challenge: nobody is to work. Due to decades of stagnating wages and living conditions over 500.000 Hungarian workers have migrated to the West causing serious domestic labour power shortage. This issue has the potential to undermine the government’s strategic vision to establish Hungary as an assembly line. Akos Hadhazy MP of Lehet Mas a Politika forcibly removed from National Television Headquarter by security guards with instructions coming from the Ministry of Interior. To establish greater labour supply, policies regarding education have already been drastically changed. The lowering of the school leaving age to 16, promotion of the dual education system and holding propaganda events as the EuroSkills competition, aims to push pupils towards a factory life at a young age. In the higher education sector, starting in 2010, they raised tuition fees, restricted free access, and kept the bursary at an unliveable low. This, along with with housing crisis, has made it impossible for many students to apply or finish a degree without working next to school, or becoming indebted. Proletarianisation of student life is becoming widespread. 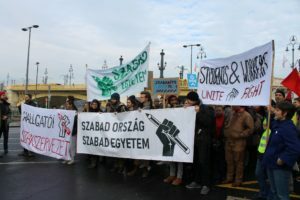 Despite this, there has not been a political movement among university students since the end of Hallgatói Hálózat around 2012. However, three major interventions into the university life changed this: First, the Minister of the Prime Minister’s Office announced the privatisation of Corvinus University. This means that there will no longer any state guaranteed free access to this university, but only scholarships funded by corporate money and handed out by a foundation. Second, the Central European University (or Soros University as the state media calls it) will stop operating in Hungary as a result of a year-long campaign against the university led by Fidesz. And finally, the accreditation of Gender Studies degree programmes was suspended, meaning that so no training of new pupils in the field will start after this year in the entire country. These events sparked massive outrage among the rather passive university students. After weeks of assemblies and plenums, students formed a new independent organisation, the Student Trade Union (Hallgatói Szakszervezet). It brought novelties to the activist scene and became one of the main actors in the protests. Their focus on material experiences of students helped to moved beyond the liberal echo chambers. With the slave law being announced, students realised that the struggle is a common one. At a demonstration held by Student Trade Union, the atmosphere differed considerably from the CEU protests last year.Bytaking on the question of access to universities and material conditions, and fusing this with workers’ issues, new perspectives were opened. The impotence of middle-class demonstrations seemed to vanish. Mobilising began for a rally to pressure lawmakers before the final vote on the proposed law. With ten thousand people on the streets, the Hungarian Trade Union Confederation made it clear from the stage: in the struggle between capital and labour, the government chose the former. Discourse about class struggle was unheard for a long time, but in the speech by members of the Student Trade Union, it was interconnected with the poverty of student life. Banners and chants about solidarity, with all the opposition parties in the crowd cheering made a weird spectacle. Police tear gassing protestors at Kossuth square. The far-right oppositional Jobbik members’ flags in the background. Ultras and Jobbik supporters are among protestors in great numbers. Fidesz based its class coalitions on a clientele system oiled with corruption and money, and the unified fight against the Eternal Jew, Soros and his supposed tool: migration. The Hungarian economy depends on two great factors: money “from the EU” and developments made by large foreign companies. The former is waning, so national economic strategy must focus on the latter. Thusthe interests of (more or less German) industrial capital are now above all. The “slave law” is the latest piece of this strategy. Working rights have been deteriorating since the first Fidesz supermajority, rewrote the Labour Code in 2012 . The main goals were to make the labour market more flexible and to restrict trade union rights such as the right to strike. These changes weakened the rights of workers and trade unions, while making the conditions more suitable for big industrial companies. The fundamental institution for tripartite social dialogue, the Interest Reconciliation Council was also shut down, along with the possibility for trade unions to influence strategic decisions. A movement already fragmented and in a part co-opted by could not stand its ground. The slave law means a new phase. It weakens workers’ rights, giving capital’s interests absolute priority over human life; it provides legal immunity to the blood-sucking vampire. This commodification provokes a response from society as its members must protect themselves from becoming commodity-like. The organised workers lead this process because of their structural position. What seemed as a quick fix and a remedy for the problem of labour shortage gave way to organising and disorder that hasn’t been seen in a decade. On the ground decommodification is a difficult process. On the day of the vote, chaos erupted in the parliament as opposition politicians tried to block the process. An unusual spectacle emerged as politicians blocked the podium used to direct the voting process while whistling and live streaming the whole event. The attempt to obstruct failed and the law passed. In the afternoon hours of the same day, people gathered on Kossuth Square – already decorated for Christmas. Everything seemed to be going according to the conventional choreography: well-situated young people chanting in the presence of an important and empty building. But the slave law touched nerves, and the crowd became agitated, throwing objects (glass, smoke grenades, firecrackers) at the police and pushing them in the front rows. We could see similar scenes at previous protests, but not at this scale. Then, they started to tear gas the crowd. This had been unseen for the past 10 years: Fidesz always avoided escalating protests with great success. Now we saw them abandon this policy, and absolute chaos emerged. Attempts were made to light the Nation’s Christmas Tree on fire, burning trash cans were thrown toward the police, and statues erected by Fidesz were defaced. They arrested dozens, some with charges of assault on police. 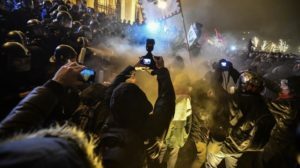 The state media announced that this is an attack by Soros-funded political activists, liberal anarchists and hungarists. As these kinds of protests continued for days, new chants were born: “Free University, Free Worker!”, “We came to do overtime”, “We won’t be slaves!”. Police began using tear gas without provocation and news about police brutality in custody has spread. As, the crowd became more accustomed to new law enforcement strategies,Trade union Facebook pages shared posts about how to defend yourself against tear gas. Opposition party leaders threw smoke grenades at law enforcement. Numbers of protestors varying fromone, and thenthen thousand walked tens of kilometres in the freezing weather, the last time, from the Parliament to the headquarters of the National TV. There, they protested its expropriation as a propaganda tool used to spread hate and lies. As protesters tried to break in the police used tear gas in front of the building. Oppositional MP’s climbed onto the building to read their claims live on air. Their violent removal became a scandal, generating heated discussions across social media and making it quickly into world news. 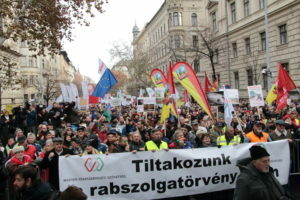 The protests spread to an unseen number of cities: Veszprém, Kecskemét, Győr, Pécs, Debrecen, Szeged, Békéscsaba, Miskolc, Eger. While symbolic victories and advancess are motivating in the short run, we must act with the future in mind. “General strike” Autonomist activists and students form a block at one of the protests. 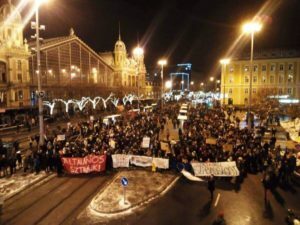 The leftist mayor of Szeged and former candidate for prime minister, László Botka, announced the city’s boycott of the law and encouraged others to support it. Direct actions carried out by previously passive MP’s and moves like Botka’s show signs of a revitalised opposition. Meanwhile, the biggest federation of trade unions (Hungarian Trade Union Confederation) supports the protests but stuck with a half closure of busy roads outside cities. After half-hearted protesting, followed by backlash, they announced the possibility of a general strike if the President of Hungary, János Áder, signs the bill. The legal environment and the density of small trade union makes it difficult to carry out a lawful general strike with enough popular support. In this struggle the symbolic aid by students, NGO’s, and the entire “civil sphere” won‘t be enough. To overcome these difficulties trade unions must rely on the mobilising skills of leftist opposition forces. NGO’s and the students know how to articulate, design, and spread messages but the masses of workers are out of their reach. Trade unions are hard to co-operate with because of their hierarchical and patriarchal internal operations and the narrow focus on “workers’ interests”. Thus this nascent movement must aim at the renewal of trade union strategies and fuse a politics based on values and material interests. This way it will bepossible to overcome the impotence of middle-class protests and to forge an opposition suitable to act effectively against Fidesz. Doing this in one country won’t bring a remedy to the creeping fascism in Europe. Worker solidarity must be institutionalised in the region, with the active help of leftist actors in the center who have mostly focused on benefitting of their working and middle class in the past decades.